N.W.F. Company Salmon Cannery, Uyak, Alaska. Photo courtesy of Anjuli Grantham. Alaska Fisheries: A Guide to History Resources by Robert King (Alaska Historical Society, 2015) is an excellent reference for anyone engaged in researching the history of the seafood industry and fisheries in Alaska. Click here for PDF version of the original 2015 bibliography. On-line version updated in January 2019. 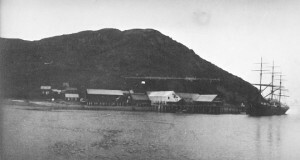 Chronological History of Canneries in Alaska. Alaska Department of Fisheries Annual Report (Juneau: Territory of Alaska, 1949-51) by Lewis MacDonald is a chronology of Alaska salmon canneries from 1878-1950 that was published by the territorial agency, the Alaska Department of Fisheries. It notes changes to canneries through 1950, arranged by region. Alaska Historical Collections within the Alaska State Library in Juneau has a portion of the Alaska Packers Association collection and an excellent photo collection, some of which can be seen through the Alaska’s Digital Archives website. Atwood Alaska Resource Center at the Anchorage Museum at Rasmuson Center produced the Cannery Resource Guide to their archival materials pertaining to canneries located in Alaska. University of Washington Libraries Special Collections in Seattle, Washington includes an excellent collection of fisheries-related archival materials, including the John Cobb Collection. The library has also digitized portions of Pacific Fisherman, which was a fishing industry journal published from 1903 to 1966. It is one of the most important publications for information about West Coast fisheries in the 20th century. The Center for Pacific Northwest Studies at Western Washington University in Bellingham, Washington has collections from several canneries. National Oceanic and Atmospheric Administration (NOAA) Libraries in Juneau and Kodiak have decades of fisheries publications, including Bureau of Fisheries reports from the 19th century. The Whatcom Museum in Bellingham, Washington has a large collection of images of Pacific American Fisheries facilities and employees within the Galen Biery Collection. The Maritime Research Center at the San Francisco Maritime National Historical Park has photographic, archival, and object collections that detail Alaska’s fisheries and maritime history. The Voices from the Fisheries is a database hosted by the National Marine Fisheries Service of the National Oceanic and Atmospheric Administration (NOAA) as a central repository for consolidating, archiving, and disseminating oral history interviews related to commercial, recreational, and subsistence fishing in the United States and its territories. The program is eager to increase the amount of oral histories related to Alaska fisheries. There are many resources available on their website to help plan fisheries oral history projects, and helpful and experienced staff are available to provide guidance to individuals and organizations who want to start oral history projects. Seattle Civil Rights and Labor History Project of the University of Washington has oral histories of cannery workers and excellent information on cannery worker unions. Project Jukebox is the digital branch of the University of Alaska Fairbanks’ Oral History Program. Many of the interviews throughout the various projects include information about commercial fishing and cannery work. Museums across Alaska and the Pacific Northwest have collections and exhibitions related to the history of the seafood industry. Unfortunately, Alaska does not have a museum within a cannery or a museum building dedicated solely to Alaska’s maritime history. The National Park Service’s Alaska Regional Office provides free technical advising services to historic property owners. That means that if you own a historic (50 years or older) cannery, fishing vessel, fish camp, etc. there is a good chance that NPS historians and architects can work with you to come up with preservation solutions for the property. National Park Service resources include excellent information on researching historic properties, why you should consider preserving your property, and conducting a Historic Structures Report. The State of Alaska’s Office of History and Archaeology can provide limited guidance to historic property owners. The Kake Cannery is a National Historic Landmark that is currently being stabilized. Learn more about the project, here. The Orca Cannery in Cordova has been turned into a lodge. The owner has restored and rehabilitated many of the buildings (www.orcaadventurelodge.com). The Thelma C is one of the last “earthquake boats” that were built following the devastation of the fishing fleet in the 1964 Alaska Earthquake. The Kodiak Maritime Museum has restored the boat and is planning to turn it into an interpretive display at Kodiak’s St. Paul Harbor (http://www.kodiakmaritimemuseum.org/programs/thelma-c.html).